Striped Horse Lager pairs a layered malt complexity with perfectly balanced hops to create textured, yet easy drinking refreshment. 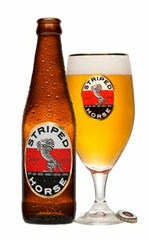 Striped Horse Pilsner is the queen of beers, both elegant and voluptuous. Its complex, hoppy nose, subtle citrus undertones and balanced bitterness on finish, make for the perfect food beer.